Let's have a look into Mardi Gras around the English speaking world. 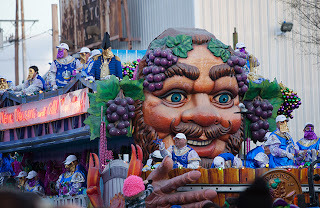 The Roman origins of Mardi Gras are the Roman festivals of Lupercalia, which has already mentioned on Valentine's Day. After being christianized by Pope Gelasius, Lupercalia developed into nowadays Fat Tuesday. On this day, Christian ate everything they got left from meat before Lent. In Mallorca, "ensaimada de tajades" and "panades",are made; therefore, sobrassada can be used and meat can be preserved. Carnival period in Louisiana starts on the Epiphany and runs until Mardi Gras. Krewes, are brotherhoods coming from Medieval guilds; they parade at weekends starting from Jan 6th. Some of the names are the Krewe des Vieux, of Excalibur, of Dionysus, among others. 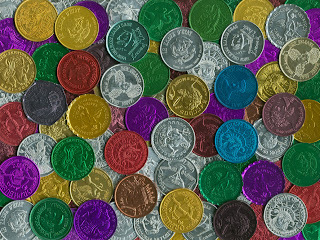 Each of them has its own float and during the big parade, doubloons, sweets or beads, with Mardi Gras colours are thrown. 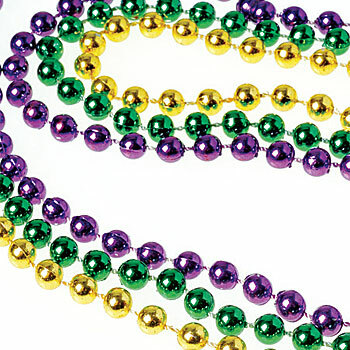 Mardi Gras's colours are purple for justice, green for faith and gold for power. On the doubloons, king's symbol or krew's emblemes can be seen. The King Cake is believed to have originated in France (Gallete des Rois) around the 12th century. These early Europeans celebrated the coming of the three wise men bearing gifts twelve days after Christmas calling it the Feast of the Epiphany, Twelfth Night, or King's Day. The main part of the celebration was the baking of a King’s Cake to honor the three Kings. The cakes were made circular to portray the circular route used by the kings to get to the Christ Child, which was taken to confuse King Herod. In these early King Cakes a bean, pea, or coin was hidden inside the cake. The person who got the hidden piece was declared King for the day or was said to have good luck in the coming year. Nowadays, the bean, pea and the coin have been replaced by a small plastic baby to symbolize the Christ Child. The person getting the baby is expected to carry on the carnival festivities by hosting the next King Cake party. 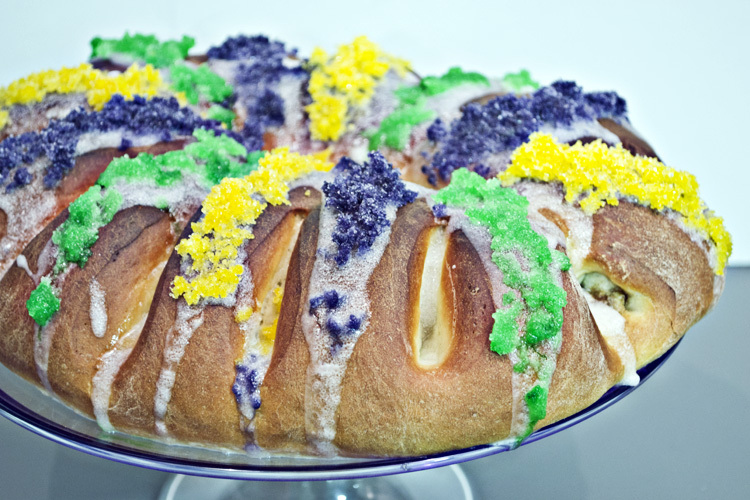 King Cakes are decorated in the traditional Mardi Gras colors; gold (for power), green (for faith) and purple (for justice). If you want to know how to bake this cake, you should visit our recipes reference blog..
Shrove Tuesday from shrive which means to confess. On Shrove Tuesday, in the Middle Ages, people used to confess their sins so that they were forgiven before the season of Lent began. As pancakes are eaten on this day, it is also known as Pancake Day. Pancake races are held all over England. The object of the race is to get to the finishing line first whilst flipping a pancake in a frying pan a pre-decided number of times. The skill lies not so much in the running of the race but in flipping and catching the pancake, which must be intact when the finishing line is reached. The most famous pancake race takes place at Olney. According to tradition, in 1445 a woman of Olney heard the shriving bell while she was making pancakes and ran to the church in her apron, still clutching her frying pan. The Olney pancake race is now world famous. Competitors have to be local housewives and they must wear an apron and a hat or scarf. The first woman to complete the winding 375-metre course and arrive at the church, serve her pancake to the bell ringer, and be kissed by him, is the winner. She also receives a prayer book from the vicar. Mardi Gras in Sydney Harbour and its campaign Say Something which invites everybody to show their support for diversity and acceptance. KYLIE Minogue has always been an icon to the gay community. So when it came to celebrating her 25th year in the music industry, Mardi Gras was the perfect occasion to mark the pop songbird's silver anniversary. The singer, 43, was the guest of honour at the annual gay, lesbian and transgender parade in Sydney's Oxford Street, before performing at the racy after-party. For extra activities to learn and observe Mardi Gras, just click on Oxford webpage.